THE CONSUMER ARE LISTED BELOW. When developing a solution the Laws regarding safety and the consumer must be considered. Below are some of the British Laws relating to safety and the consumer. They are aimed at protecting the general public, especially young children from dangerous products. It is very important that the laws are not just listed. You must explain how each of the laws affects your design / product. An example is shown below. It is based on a design for an educational toy for a young child. The Consumer Safety Act is mainly concerned with safety especially when considering clothing, toys and electrical goods. The government can ban dangerous goods with this Act. In order that my design is not breaking any safety laws I will make sure that it is tested by several people. These will include friends, parents and qualified people. If I had my own business I would pay for the product / design to be tested by the British Standards Agency. If it passed the product would receive a safety certificate and the British Standards Kite Mark could be applied to it. The Trades Description Act protects the customer against false claims. For instance if a manufacturer says that a product will increase intelligence and it obviously fails to do so - then the manufacturer can be taken to court. The Trades Descriptions Act tries to ensure than manufacturers claims about their products are true. I will not make any false claims when I write a summary about my design / product. Any instructions written for my product will clearly state its purpose and limits. Instructions will be written in plain English so that they cannot be misunderstood. I may ask an independent person to put my design / product to the test. He / she can then write an evaluation. This can be placed on my design / product before it goes to a customer. The Sales of Goods Act is aimed at ensuring that goods work in the way they should and that they last a reasonable amount of time. Before my product goes to the customer it will be vigorously tested and any faults will be corrected. My product will carry a guarantee so that in the event that it breaks or fails to work it can be returned and money returned. My product will last / be useable many years. Fire Safety Regulations - aim to protect the public against poor quality furniture that could be a fire hazard. The aim is to stop the sale of furniture that is easily set alight and give off dangerous toxic fumes. My product will be manufactured from safe and mainly natural materials such as woods. Although synthetic materials such as plastics may be used, these will be used in small amounts. This means that the materials will not pose a danger, even to children. Lead free paints, probably water based paints will be used. These are kinder to the environment. 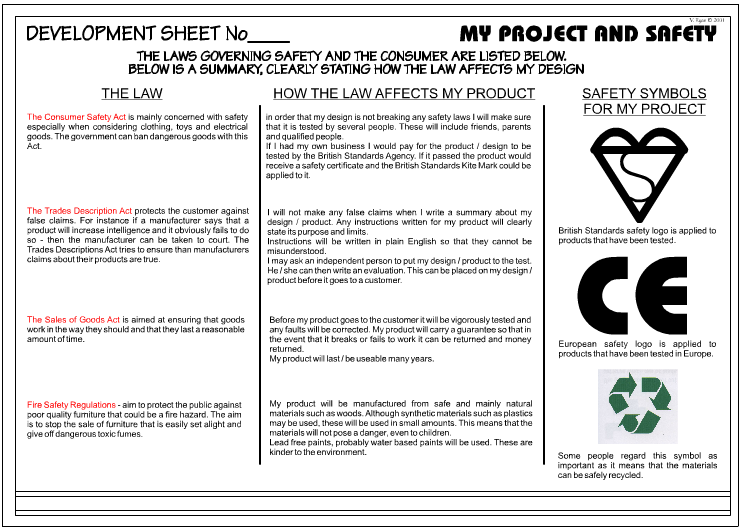 When producing a design / development sheet on 'safety and the consumer', drawing some of the safety symbols shows that you thought about its importance. These symbols show that the design / product has been tested by safety standards agencies such as the British Standards Institute. If the product passes all the necessary tests the manufacturer is allowed to display the British Standards 'kite mark'. Also, if you draw the symbols it shows that you understand what the general public look for when inspecting a packaged product. British Standards safety logo is applied to products that have been tested. European safety logo is applied to products that have been tested in Europe. Some people regard this symbol as important as it means that the materials can be safely recycled. QUALITY MARK - Created in 1988, when the Lion mark is displayed on a product it means that the manufacturer/retailer has agreed to the ‘British Toy and Hobby Associations’ Code of practice. It is a consumer symbol that represents the manufacturers promise to conform to all relevant safety information. Also, it means that the manufacturer will not counterfeit existing toys and will advertise the product so that advertisements state the truth about the limits regarding the way the toy performs.